The series: Texas leads 22-15. K-State beat Texas 87-69 last month in Manhattan. About the Longhorns: Coach Karen Aston encourages fans to wear pink for the annual Shoot For A Cure game to recognize breast cancer awareness. 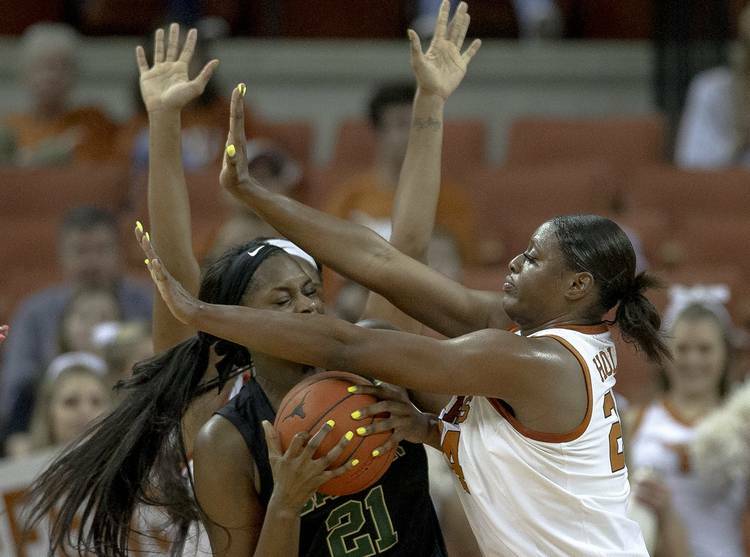 … Texas is coming off a 61-55 victory at Oklahoma State on Tuesday. Sutton had one of her best games of the year, posting 17 points, 7 rebounds and 6 assists. … On the recruiting front, Westlake guard Shay Holle, who has committed to play for the Longhorns beginning in the 2020-21 season, recently scored her 1,000th point of her high school career. … Next up for the Longhorns will be a game against Texas Tech on Saturday at the Erwin Center. Tipoff is set for 11 a.m.
About the Wildcats: K-State had a sensational shooting night in its victory over Texas, shooting 53.6 percent from the field (30-for-56), 58 percent from 3-point range (11-for-19) and 89 percent from the free throw line (16-for-18). Goth led a balanced attack with 20 points while Carr scored 19 and Williams 18. … Coach Jeff Mittie has a 94-64 record in his five seasons in Manhattan. … The Wildcats boast a tall backcourt. All three of their starters — Ranke, Carr and Goth — are 6-1. By comparison, UT’s backcourt includes 5-10 Williams, 5-9 Littleton and 5-7 Sutton. … No. 15 Texas is the only ranked team the Wildcats have beaten in the AP Top 25.